The family of Dasia Patterson, who was murdered along with two of her children, spoke out about the tragic killings on Saturday. “My daughter was one of the most humble in the world. Sweet, honest, and wouldn’t harm anyone,” said Cynthia Patterson, Dasia's mother. 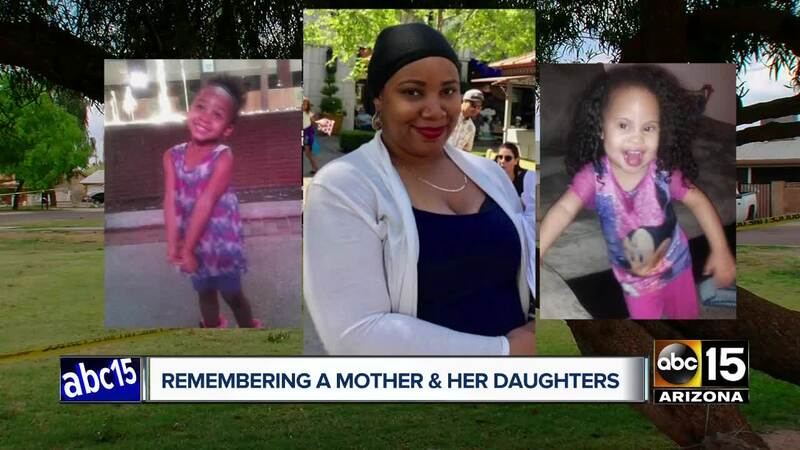 ABC15 spoke with Cynthia Patterson Saturday about the loss of her daughter and two grandchildren. His oldest daughter, 7-year-old Mayan Smith, died of blunt force trauma police say her father inflicted because she was crying. Investigators say Smith admitted he did not kill his youngest daughter, a 3-year-old, because she "reminded him of himself," whereas his other daughters reminded him of his wife. “They were the most beautiful, sweetest children in the world,” said Cynthia. Dasia's entire family came to Arizona from California after learning about the killings. Dasia's brother is about to graduate from high school, and while the family was focused on planning a celebration, Cynthia says they're now forced to plan three funerals. "We are in anguish over the senseless loss of our beloved Dasia and her young children. As we try to process our profound grief, our focus is on the welfare of her sole surviving three-year-old daughter. She just lost her mother and sisters, and we want nothing more than for her to be with her family right now. We understand that it is the weekend, but we are hoping that the authorities can help reunite us with her as soon as possible so that she is not in the care of strangers at this incredibly painful time. Finally, we ask that the public respect our privacy so that we may begin healing." Police say after Smith killed his wife and two children, he then went to where his brother was staying, an apartment near 67th Avenue and Osborn Road. He first encountered Ron Freeman, a family friend who said he was crazy to think his wife would cheat on him. Smith shot Freeman repeatedly, even after he had fallen to the ground. He was later pronounced dead at the scene. In a probable cause statement, police say Smith admitted to then going to his car, grabbing a rifle, and started to shoot at friends of his family trying to help Freeman because God told him to shoot them. Smith eventually left the scene but was stopped by police a short distance away and taken into custody without incident.